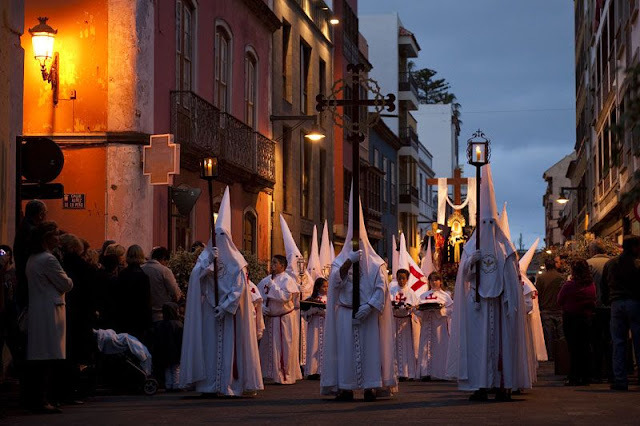 According to Google, the 2019 Semana Santa (Holy Week) in San Cristóbal de La Laguna [yet, I'm sure there's a clue in the title there] would begin on Saturday, 6 April and end on Sunday, 21 April. According to the extensive program, however, events actually began and continued throughout Lent, starting on Ash Wednesday, 6 March 2019. 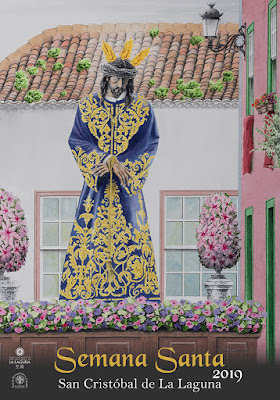 We'll confine ourselves to the main events for Holy Week itself, starting with the parades on Domingo de Ramos (Palm Sunday) and those on Viernes Santo (Good Friday). From Palm Sunday until Good Friday, various processions take place from the temples located in the periphery of the urban center, to the Santa Iglesia Catedral (La Laguna Cathedral), accompanied by the different Brotherhoods (in their KKK-like garb), until all of the icons are all gathered at the cathedral and all then go out in the impressive Magna Procession of Good Friday. On Palm Sunday, 14 April 2019, at 10 am at the Casa Mesa - Antiguo Colegio Nava la Salle - the palms will be blessed by The Most Reverend Bishop Bernardo Álvarez Afonso, followed by the Procesión Solemne de Ramos (Solemn Procession) to the cathedral, where Eucharist will be celebrated at 11 am. At 12 midday there will be the Procession of Jesus' Entrance into Jerusalem. Further processions follow at 5 pm and 6 pm. 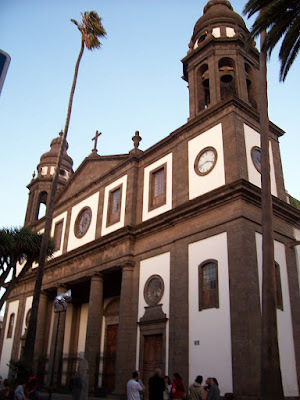 On Jueves Santo (Holy Thursday), 18 April 2019, from 10 am to 2 pm in the Plaza de la Concepción, a collection of foodstuffs for the benefit of those most needy in the city will be made by the Junta de Hermandades y Cofradías. There are various processions at 7:30 pm, 8 pm and 8:30 pm. 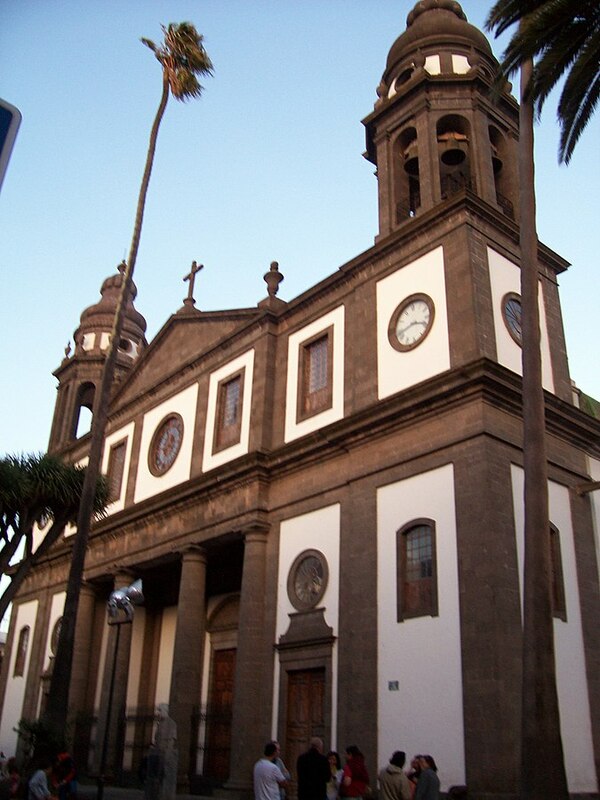 Viernes Santo (Good Friday), 19 April 2019, dawns in La Laguna with the smell of incense and the echo of "malagueñas" sung to the Cristo de La Laguna (Christ of La Laguna) as the Procesión de Madrugada (Early Morning Procession) at 02:30 hrs transfers the image from his Sanctuary to the cathedral. The two main 'attractions' are the Procesión Magna starting at 5 pm, and the Procesión del Silencio (silent procession) at 10 pm to move the image of the dead Christ to the Parish Church of Santo Domingo. Silence is broken only by the tinkling of bells in its slow pace through the dark streets of the city of the Adelantados.